The Village in Gatlinburg is a beautiful shopping enclave with a European feel and more than two dozen specialty shops, eateries, galleries and clothiers. It’s a place for a leisurely and discovery-filled shopping experience, a relaxed cup of coffee, a breakfast or lunch snack, as well a place simply to sit and watch, enjoy the weather, or – everybody’s favorite – snap a souvenir selfie in front of the fountain. The Village is downtown on Parkway – close to Light #6 – but one step across the threshold takes you into an oasis of charm, a haven from the bustle of Parkway and a favorite destination for many visitors to Gatlinburg. The Village was carefully built in 1968 with Old World Europe in mind, and it has remained true to form with gas lighting fixtures, homemade bricks, and heavy carved doors open to a magical mix of European and Gatlinburg curiosities. Although the Village is located in downtown Gatlinburg, it typically feels worlds away from the bustle that is characteristic of the Parkway during peak travel seasons. The Village is easily accessible from Parkway, but once you’ve stepped into this open-air pavilion of stores, walkways, and gardens, it instantly feels like you have discovered a hidden gem off the beaten path. Notable design features in the Village include seasonal landscape designs, and a gorgeous fountain that’s a popular spot for photos with your group. As you explore the Village, you’ll be captivated by the bygone European charm mixed with the friendliness of the locals that the Smoky Mountains region is famous for. What do you do on your trip when the dad in your family is really into studying Celtic heritage, the kids desperately want some new toys, and grandma just wants to look for a new pair of comfy socks? You go to the Village in Gatlinburg! The most exciting thing about the Village is that it’s a destination that every member of your group will put on their must-visit list, because there is enough variety for everyone to find something of interest. Cheese lovers can check out the impressive display of imported and domestic options at the Cheese Cupboard, coffee aficionados can get their caffeine fix at Coffee & Company, and outdoorsy types can prepare for their Smoky Mountains adventures at the Day Hiker. And that’s only scratching the surface: check the full list and descriptions of Village Shops. Even if you aren’t looking for anything in particular, browsing the walkways and storefronts of the Village is an enjoyable way to spend a day or evening. The Village is located in downtown Gatlinburg at 634 Parkway, near traffic light #6, which is a trolley stop if you want to take the trolley and leave the car behind. The Village is open year-round, but shop hours vary depending upon the day and time of year. 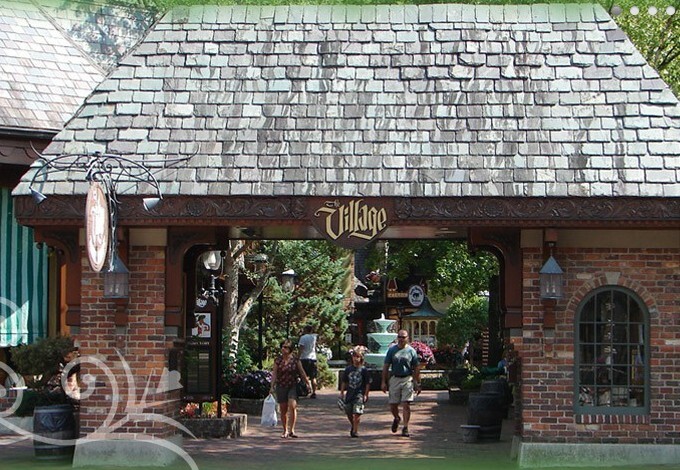 For a full list of shops at the Village, and updated information on operating hours, visit the website at TheVillageShops.com. And whether in Gatlinburg or Pigeon Forge, or over on the Quiet Side of the Smoky Mountains, everything is close to one of our Gatlinburg cabin rentals, Pigeon Forge cabins, and Wears Valley cabins.